From an early age, John has always enjoyed the 0utdoors and working in landscape. He has been involved in the professional green industry since 1994. His father and grandfather enjoyed working with landscape projects and John was always by their side. 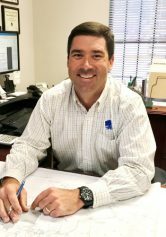 Upon graduation from Auburn University with a degree in Ornamental Horticulture, he moved to Birmingham in 2001 to take a position with a local site work company as the Landscape Manager. During his time there he learned a great deal on grading, drainage, and furthered his knowledge of landscape construction. In 2004, he formed Richter Landscape Company with the goal to provide customers with a full service landscape company. John is actively involved in local green industry organizations, the community, and in his church. When John is not working he enjoys spending time with his wife Holly and their 3 children, John Martin, Logan, and Carlisle. He also enjoys the outdoors, coaching his children in youth athletics, sports, and running triathlons.